Dogs Aren’t Afraid of Stairs! Well, my Still True Friend Alan (@cogdog) is having a birthday today and so I made him an Art and posted it on my Flickr. It is up above these words, so you already looked at it. One good thing about Alan is that he is not clumsy on stairs, because that is not a good thing to happen. Like it did for that other guy. Another good thing about Alan is that he is not afraid of stairs. Because when you want to get from one place to another like from one floor to another or into a building or on the way back out then there are stairs and you do not want to be afraid of going from one place and getting to another. Like if you need to learn how to get from one thing to another and there are stairs in between of it, then you need to tackle those stairs right on and get there so you can learn it. So that is a really good thing about Alan because he is always learning about how to get to it there and he does not worry about the stairs. Plus, if there aren’t any stairs there, then he just builds his own stairs, which is pretty amazing most of the time when you think about stairs. Do you always stop when you get to the bottom or the top of stairs? Even if there is a lot of the stairs? Well, you should not. Like my Still True Friend Alan, you have to just go up the stairs or down the stairs however you have to so that you can do it and get there. 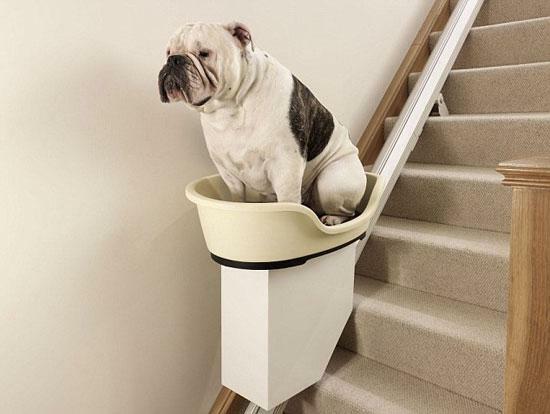 Plus, I found some pictures of dogs on the Internet that have their own special elevator which I guess is okay for them because they have maybe problems with stairs, but they still want to be able to get there. Go Dogs, Go! So, HAPPY BIRTHDAY to you, my Still True Friend, Alan (@cogdog) , and I hope that you keep going up and down a lot of stairs #4life, because that is what stairs are for! Plus, in dog years. 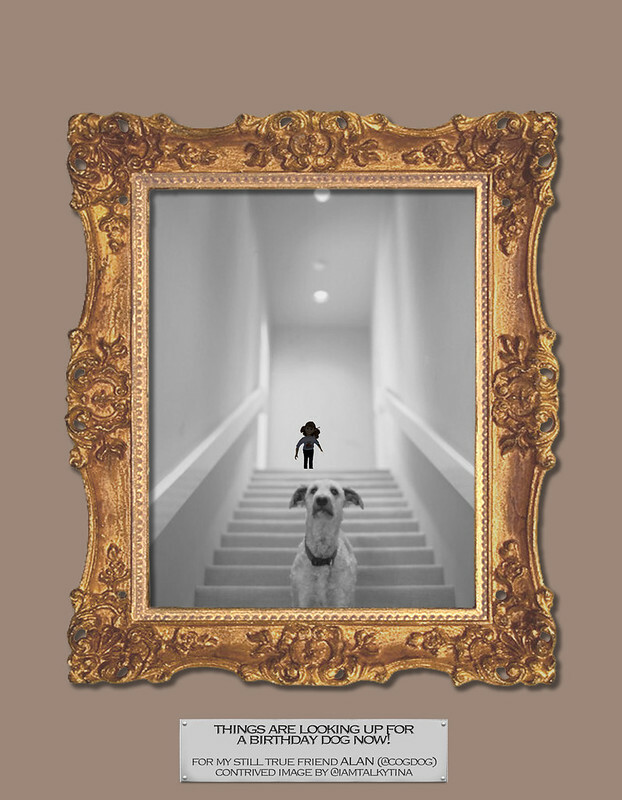 This entry was posted in Assignments, Design, ds106, friends, The Daily Create and tagged @cogdog, Alan Levine, birthday, ds106, stairs, Still True Friend on April 27, 2014 by iamTalkyTina. Well I started with the best for first. 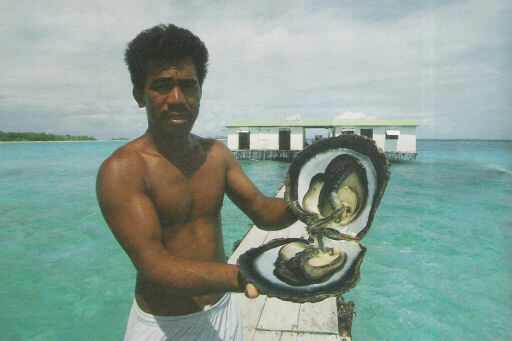 Because that is the best of the Pearls of Jim Groom Oyster Pictures from the World that I have. I hope you enjoy it and appreciate the funny joke part of it. Plus, it is a True Art, I think. 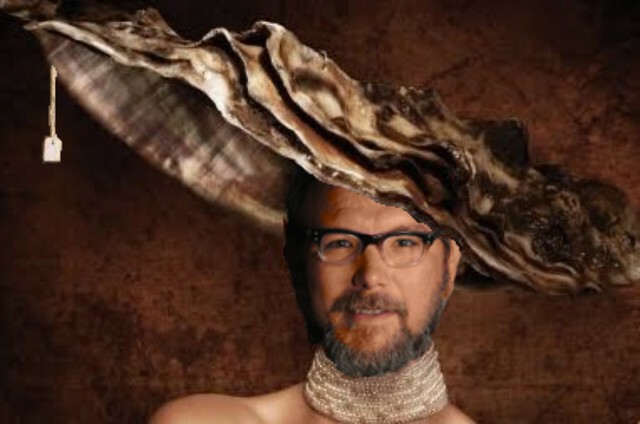 By the way, these pictures are all for The Daily Create, April 14th, tdc827: @jimgroom the World is his Oyster. 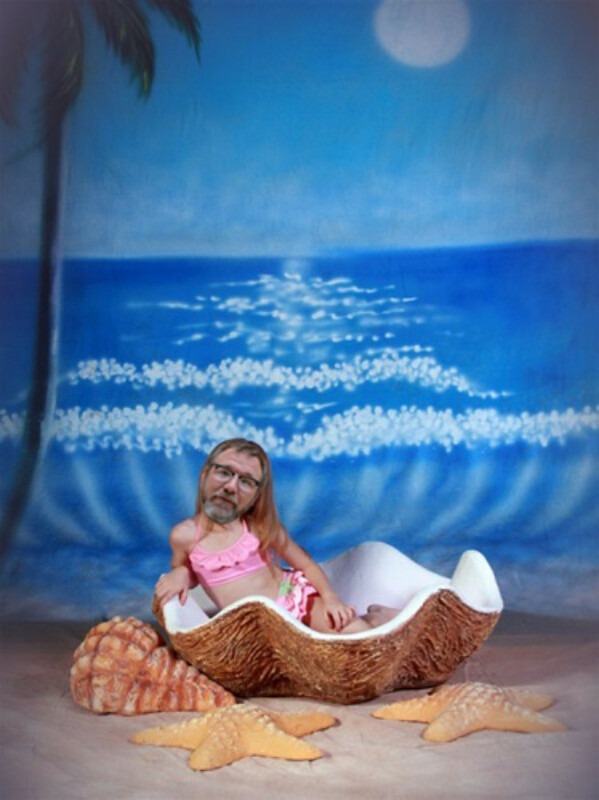 Next, how about this one of UNCLE @jimgroom in an oyster on a beach. 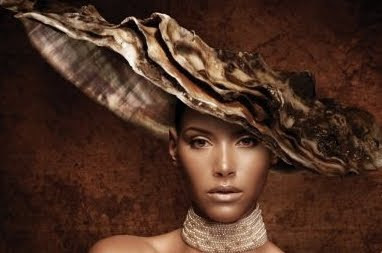 Plus, do you see how the moon is like a pearl up above the oyster. That is some of the Art of this one. 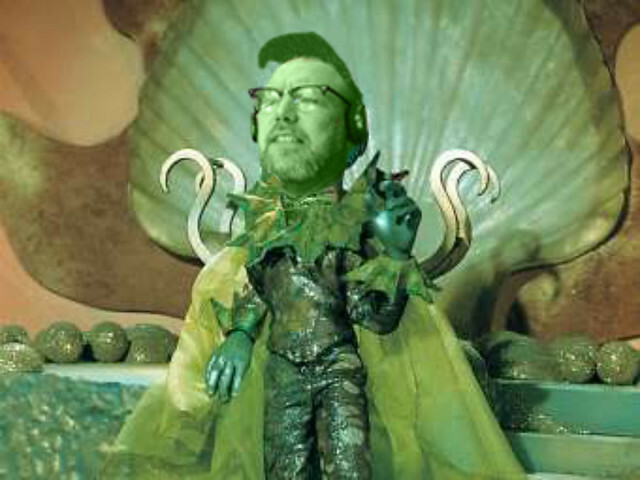 Next, it is UNCLE @jimgroom from a Thunderbirds movie with him as the Evil Green Oyster Man. 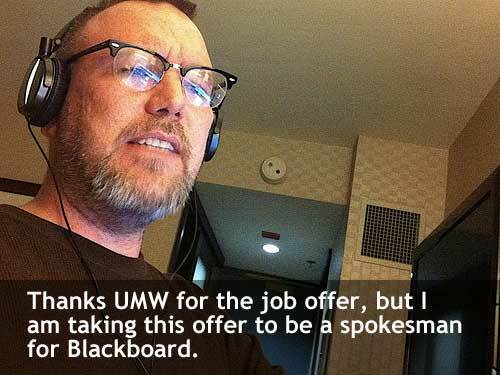 Now, the Fisherman, UNCLE @jimgroom, outstanding in his sea. 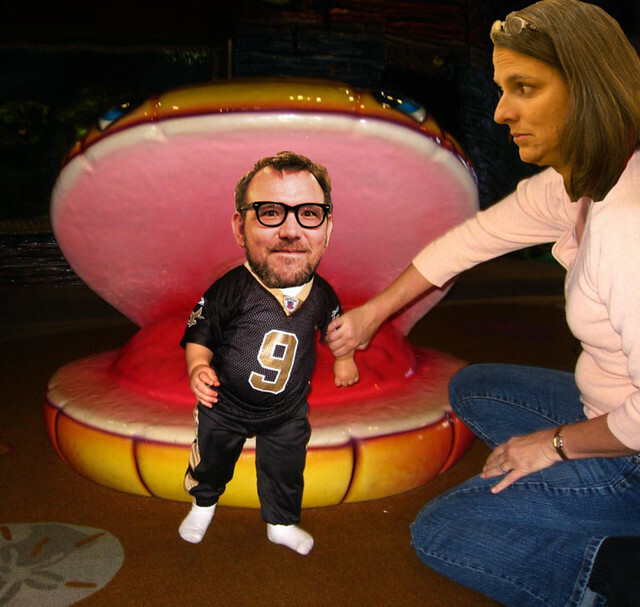 Then, LOOK!, it is little UNCLE @jimgroom and his Red Oyster with his babysitter. Finally, the finale of Dancing Around The Giant Pearl of the World UNCLE @jimgroom Dancing of it Animated GIF. It is another special rendition of Animated GIF Assignment 1001: Dancing Jim All Over the World. He is still dancing, which just goes to show! 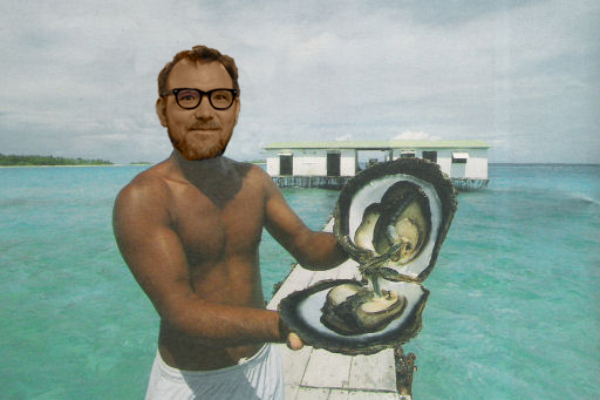 I hope you liked all these Oyster pictures of UNCLE @jimgroom that I found for you. He is certainly famous when you look on the Google, and now, even more so! Just in case you wanted to know where I found them, you can look at all these links. This entry was posted in Animated GIF, Assignments, ds106, friends, The Daily Create, Visual and tagged @jimgroom, @mburtis, AnimatedGIF, AnimatedGIFAssignments, AnimatedGIFAssignments1001, ds106, friends, Jim Groom, Martha Burtis, Minnie Pearl, tdc827, the Daily Create on April 15, 2014 by iamTalkyTina. True Friends support their True Friends. And that is why my True Friend Warren Harding doesn’t use the Mean Word. 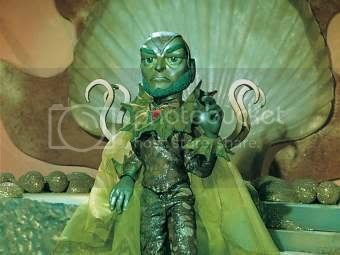 So I would take a Warren Harding to a GIFfight! This entry was posted in Animated GIF, ds106 and tagged AnimatedGIF, ds106, GIFFight!, Warren Harding on April 12, 2014 by iamTalkyTina. Well, it was my #GIFfight friend (why is he not a True Friend, it is just so simple to just apply to the web form?) Ryan (@ryanseslow, on Twitter) who made a GIF of many ladies moving forward (although some of them are moving backwards) on two days ago April 4 and it has over 2648 notes (which are the Tumblr of likes but they call it a reblog where someone just puts it on their Tumblr but they didn’t make it like @jimgroom doesn’t) AND IT ISN’T EVEN a LADY of ME! 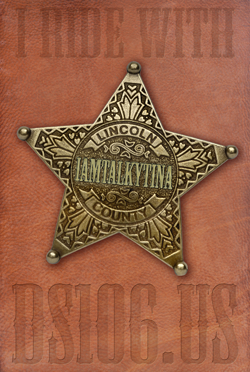 So I made my own and it should have more likes I figure. Because not only am I a not cartoon lady like in his picture, but I am a real actress lady and a ninja, plus all my #ds106 True Friends. This entry was posted in Animated GIF, Assignments, ds106, friends and tagged @jimgroom, @ryanseslow, AnimatedGIF, ds106, GIFFight!, Many Move the Painting Forward, Move the Many Tinas Forward, Ryan Seslow, Tumblr on April 5, 2014 by iamTalkyTina.